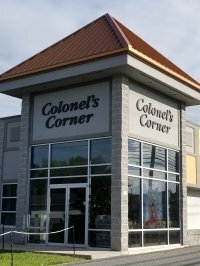 Come in and visit us to see our new place! We've had quite a few volunteers that want to come and help paint so we can get into our new location. So if you want to help, put on your painting clothes, and bring a roller and a paint pan. We will supply the paint, roller covers and the lunch! Sunday, October 15th from 9 - ? Monday, October 16th from 9-? Wow! What a busy month it has been! Packing, painting, classes, quilt shows....whew!!! I have been amazed at how easily problems have been solved and how quickly things are getting done to prepare us for our move at the end of the month. Blessing after blessing have come our way this month and I just am overwhelmed with everyone's kindness and help to try and get us to our new location. I have to give a great big thanks to the ladies who came to help us paint. Wow! What I thought would take us a week to finish, was done in a day and a half. You gals are amazing! I just cannot say thank you enough. I was so worried about making the decision to move. I guess that everything going so well is validating that it was a good decision! I am so excited and anxious to get in, walls are up and new electric going in this week. More painting this weekend! Thanks again everyone for all of your support and help. Kelly, Elisabeth, Barb and of course, Tootsie too! We still don't have a winner! 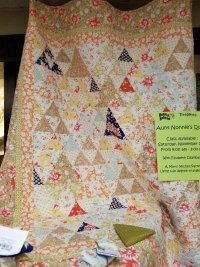 You have until October 31st to turn in a finished quilt that has 8 rows from 8 different shops, pieced, quilted, bound and labeled to win our 25 pack of fat quarters! 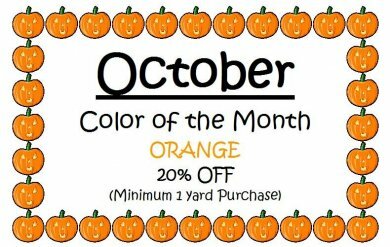 Include our row and get a $25.00 gift card as well! Please note we will be having our Sewcial and doing some "class time" as well. 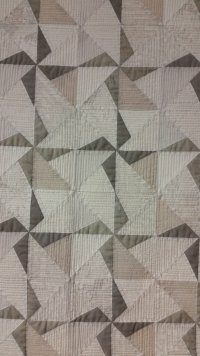 Have you wanted to learn to hand quilt? This is the class for you. Cheryl will walk you through the basics of hand quilting, from marking your quilts, to getting those perfect stitches! 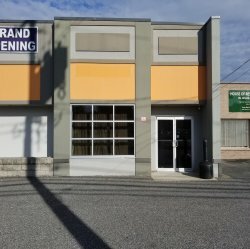 November 1st - Opening at new location!!! 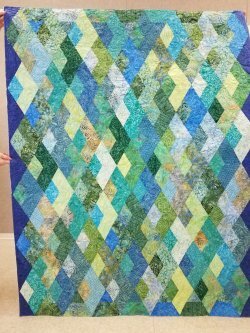 Join Cheryl to make this great quilt from Jaybird designs using their Super Sidekick Ruler. Scrappy or use monochromatic lights, mediums and darks to add that special character. Join Sandy in discovering the art of Disappearing Blocks. She will teach you the techniques for a Disappearing Pinwheel, Disappearing 9 patch and Disappearing Hourglass blocks. 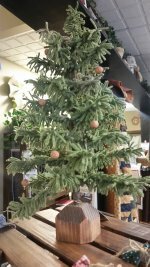 This 15" Wooly Pine Tree will be a great addition to your Christmas Holiday Decor. Come to class, go home with a completed project. Mary and Jackie will walk you through the process and supply everything you need to make the tree. Class fee does not include kit. Kit is $25.00 (required) and must be purchased from instructor on the day of the class. A unique version using the 60 degree triangle. No Y seams and fun to put together! IF you want to see what is coming up in a calendar setting, click here to view our full calendar. Every Tuesday and Friday from 10-5, Hoppin Bobbin hosts a Sew in Day. Bring a project and all of your supplies and have a great day sewing with friends. Bring a covered dish to share. If you are planning on staying the day, please fill the parking spots in the rear of the building first. This enables new customers to find parking in the front of the building. Just a reminder that our quilting cutoff date for Quilts to be returned for Christmas is November 7th. 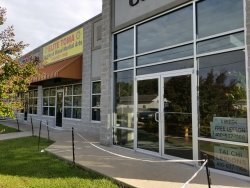 We are extending this date from the 1st to the 7th, since we will be closed several days the end of October for our move. So, get those quilts done so you have plenty of time to do that dreaded binding! There will be rush fees for any quilts received after the 7th that need to be returned before Christmas. Save the Dates! 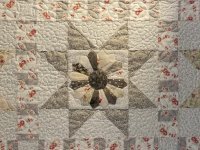 !- March 2nd-11th, 2018 - Quilts Around the Bay Shop Hop is already in the planning stages. Our theme for 2018 is "Stars Over the Bay". Hoppin Bobbin is presently looking for a part time Team Member to join our team. If you are interested, please contact Kelly at info@hoppinbobbin.com. You must be able to lift a minimum of 30lbs., have some quilting experience, basic math skills and a love of fabric necessary.